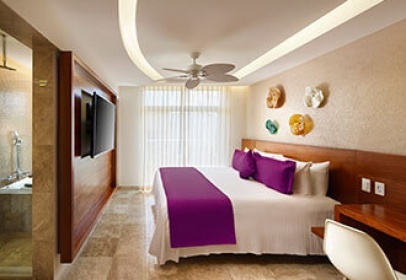 If you are looking to stay in the heart and soul of all the action in Playa del Carmen, then Senses 5th Avenue by Artisan is the ideal place to stay. 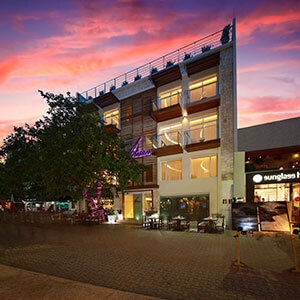 Located on Playa del Carmen’s vibrant 5th Avenue, you will have access to a variety of restaurants, shops and nightlife just a few steps away. When you arrive to the hotel, you will be in for a pleasant surprise; it is hard to believe that behind its facade, there are 22 spacious rooms. In addition, the central area of the hotel is circular in shape with natural lighting, and some of its corridor walls are adorned with reproductions of famous paintings that combine perfectly with the modern style of the rooms. As the hotel is exclusively for adults, all of the facilities are geared towards relaxation and romance. Some rooms have private terraces overlooking 5th Avenue, and are recommended for those who want to enjoy the excitement of this popular street. The hotel has two entrances, either through the hotel lobby or from the ground floor where you can enter with your electronic room key with access directly to the elevator. On the ground floor, you will also find a small TV room for entertaining. 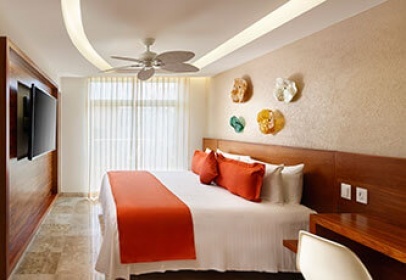 The rooms with jacuzzis are idea for honeymooners or for those enjoying a romantic getaway. On the top floor of the hotel you will find a magnificent terrace, from where you can take in spectacular views of Playa del Carmen. It also has a fabulous infinity pool, jacuzzi and loungers for your comfort and relaxation. Here in this area you can complement your experience with a beverage or two from the pool service. The hotel staff is always cheerful and attentive, helping you with any requests you may have. 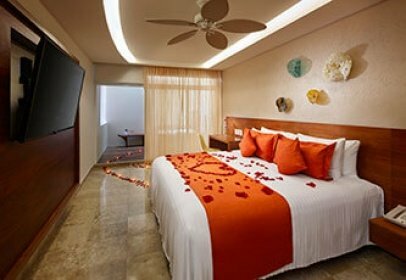 The concierges can also support you by organizing your stay in Playa del Carmen, helping you to make the most of your vacations according to your preferences. All the rooms feature 60" televisions, a coffee maker, mini-bar and black outs to make your stay even more comfortable. Ideal for couples or groups of friends who want to explore Playa del Carmen and enjoy all the activities that the destination offers. All rooms feature 60" televisions showing premium channels, a Nespresso coffee maker, mini-bar, safe, iron, ironing board, air conditioning, Wi-Fi, remote control black out blinds and a bathroom with rain shower. A room with a king-size bed, private bathroom with shower. A suite with a king-size bed, private bathroom with shower, plus a private terrace with its own jacuzzi. In low season, there is no charge for cancellations made with at least 72 hours notice prior to arrival, otherwise, the cost of one night’s stay plus taxes will be charged. In high season, no charge is made when cancellations are made at least 30 days prior to arrival, otherwise, 2 night’s stay will be charged. For New Year, your entire stay will be charged. In low season, one night’s stay will be charged, in high season the penalty will be for the entire stay. Rates do not include taxe. The hote do not offer transfer service. A gourmet breakfast is offered daily on the ground floor of the hotel, which includes a breakfast bar featuring cereal, fruit, bread, coffee and tea. Main dishes are also served, giving wider variety to your breakfast. This is a great source of energy for all of the activities you can enjoy throughout the day.